I’m looking to change things up a bit in my daily habits. At the top of my list is drinking more water and staying hydrated in every area of life. Drinking lots of water is good for the insides, and has beautiful-skin benefits, too! A friend of mine served me water during a recent visit. Then she asked if I wanted to add some “switchel” to it. 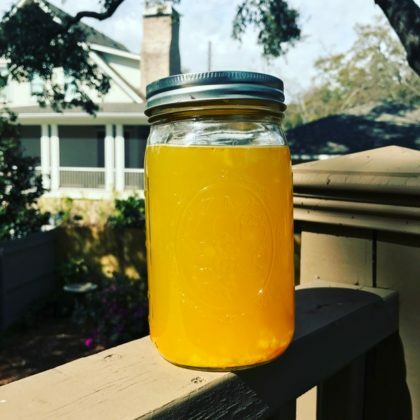 She took out a beautiful jug of sunshine from her refrigerator and explained that it was a fermented concentrate that she adds to her water, for flavor and other added benefits. Although I’d never heard that term, I was quite familiar with the concept because I love to add a splash of cranberry juice to my water bottles to make it a little more interesting. This switchel recipe is my first outing, but I can tell already it’s something I’ll keep on hand in my fridge, especially with the warmer months approaching. It contains turmeric which is a fabulous anti-inflammatory. Without further ado, here’s the recipe. Let me know if you think of a fun twist on this. Leave a comment! Place all ingredients into a jar. (Because the honey is a solid, I used warm-ish water to help it melt and mix faster.) Shake well. Refrigerate overnight. The zest and minced root will settle at the bottom of the jar. Shake it before you use it. 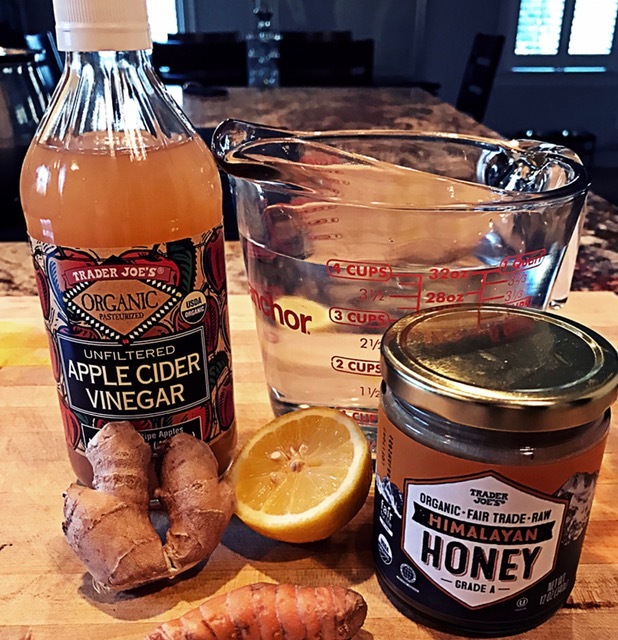 When you want to drink this potion, remember it’s a concentrate: you will pour a splash of this into your water, to suit your taste.